Secure Livelihoods Research Consortium | Service delivery in fragile states: meeting expectations or missing the point? Is it possible to deliver basic services effectively and efficiently, and at the same time enhance state legitimacy in fragile states? I should admit to being highly sceptical of ‘win-win’ situations. I’m reminded of the agricultural economist, Michael Lipton, telling me very early in my career: ‘Rachel, I have never in my entire career seen a single case of two birds being killed with one stone.’ And I work predominantly in the social protection sector where, albeit slowly, we are learning that if you heap too many objectives on to a simple instrument like cash transfers or school feeding, you risk not achieving any of them satisfactorily. I have similar concerns [^] about the common mantra that we hear in development agencies about fragile states: deliver basic services, especially health, education, water and sanitation, and (hey presto!) enhance the relationship between citizens and the state. Is it possible to deliver basic services effectively and efficiently, and at the same time enhance state legitimacy? I’m not sure. We know that some programme design and implementation choices that focus on, for example, building state legitimacy, lead to sub-optimal outcomes for the development of human capital and, therefore, for the reduction of poverty . Put more simply, trade-offs are everywhere. So what more did I learn about this at the WDR 2004 10th Anniversary Conference [^] in Washington D.C. last week? And what continues to niggle and remains unresolved? example. Paul Collier suggested that governments should take overall responsibility for the delivery of services but not the function itself. Derek Brinkerhoff [^], Egbert Sondorp and Jacob Shapiro [^] focused more on how to manage resources and funds to deliver services and provided some important insights about the kinds of changes needed in the roles and approaches of development agencies and governments, especially around resourcing, leadership and accountability. My second lesson was that we must not be too simplistic in the way we portray thinking by donor agencies about the service delivery – such as my own caricatured description of the common mantra of development agencies on services and state-building above! We too often set up a straw man to knock it down (we oversimplify donors’ positions and then we prove the actual situation is more complex). For example, Alan Whaites stressed that the OECD’s message about service delivery and statebuilding has somehow been distilled to focus on the actual delivery bit, when, in actual fact, the OECD posited that meeting people’s expectations in relation to service delivery (not just delivering services) was a mechanism that might increase state legitimacy. And we need to heed Jacob Shapiro’s experience in Pakistan where he found that, while the delivery of services following floods in 2010 didn’t lead directly to increased state legitimacy, it did increase participation in elections in targeted areas. And the unresolved issues? Well, I’m left with a concern that the current approach to building (state) institutions and delivering services in post-conflict situations pushes for a transition from humanitarian assistance to building state capacity far too quickly. 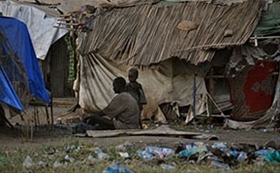 This is problematic because of the lack of absorptive capacity and access to remote areas –Egbert Sondorp described how large health infrastructure projects in South Sudan were only able to build hospitals just outside Juba and failed to expand health infrastructure much further than that. But I have a deeper concern – one that emerges from the last week’s discussions about the roles of state and non-state providers, the extent to which there are trade-offs between enhancing state legitimacy and delivering services, and what sorts of transitions are required post-conflict. My concern is whether, in the current push to move rapidly to state delivery of services following a conflict, and to build the capacity of state at speed (rather than have non-state provision) we are investing in services in conflict-affected situations that are not even vaguely conflict-proof. Conflict and violence rarely come to a full stop right after a peace agreement, and many countries slide back into conflict or remain fragile, but how far does our programming insure against that? Rebecca Winthrop pointed out that in the education sector, too much attention is paid to who is delivering services, and far too little to whether children’s education is able to continue, uninterrupted and without disruption, during conflicts. Ultimately, I came away from the WDR 2004 anniversary meeting wondering about South Sudan, and how much of the millions of dollars of investment in building services there has survived the violence of December 2013 and remains intact? Rather than prioritising state-building objectives in relation to services, should we not focus more on ensuring that our programming is conflict sensitive and will be sustained even in the face of further violence? This piece was originally published in “Public services at the crossroads: Ten years after the World Development Report 2004: reflections on the past decade and implications for the future [^]“. Rachel Slater, Service delivery in fragile states: meeting expectations or missing the point?